19 FEBRUARY 2018 ‘Fat, Sugar, Salt’: it is an evocative little list. Put the ingredients together and you have the core attractions of the foods that cut straight to the low pleasure centre of the brain: fried chicken, crisps, burgers, kebabs. Junk, in other words. Bad stuff, and, as a dietary set, horribly well plugged into modern Britain’s neuroses and judgements about health, class, and education. You are what you eat, after all, and junk food now has about the same status in public discourse as gin did in Hogarth’s time: decried as both cause and symptom of social malaise. But don’t get carried away, because that stuff is absolutely delicious, and you like it too. 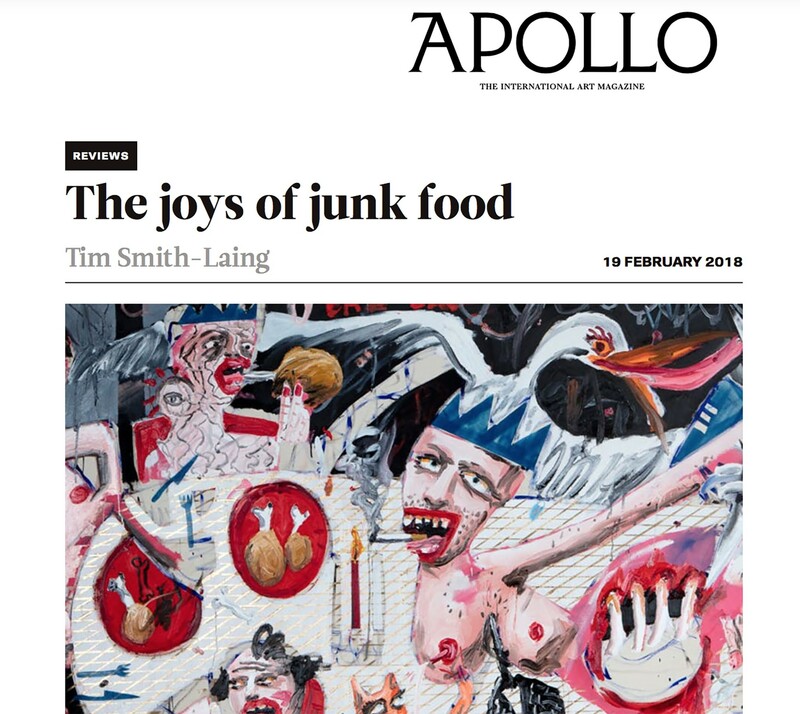 Appetite is central to the exhibition of exuberant, off-putting, hilarious paintings by Dale Lewis currently on view at Edel Assanti – in particular the kind of base appetites associated with junk in all its various guises. A family dinner turned into cannibal feast, a picnic turned animal carnival, drunks wrestling naked at chucking-out time, or the body of a murdered soap actress posed naked like an odalisque: Lewis’s main subject is the nexus of fears and pleasures that go with people satisfying their appetites with, through, and upon each other. Food is the least of it, though there’s plenty floating around in a sort of gruesomely appetising way. Fried eggs sit on black platters among the fruit and veg of Club Tropicana (2017), and drape over flesh-pink squares in the picnic scene of Special K (2017); fat drumsticks wait on the plates of the diners in Family Fortunes (2018). But this is nothing to the compulsive greediness that rules everywhere here. Just about every figure in Lewis’s densely populated canvases has to be sucking or chewing on something – from the ubiquitous smokers right down to the shrunken brown creature rearing up out of the water to suckle the dug of a female corpse in Regent’s Canal (2017). Which is not to mention the thread of other kinds of junk pointed up in the paintings’ titles – TV (Family Fortunes), music (Club Tropicana), booze (White Lightning ), drugs (Special K) – and the general miasma of tabloid prurience and voyeurism over women and death (Regent’s Canal). As commentary on the way we live now, and on London life in particular, it is cuttingly funny. Lewis turns his brush on the world around him, from family gatherings to pub fights, murders, and street scenes. But it for all the social realism, you could hardly call Lewis’s a documentary eye; there is too much humour for that, and too much swirling weirdness. In Family Fortunes it’s the artist himself who is the main course, being cheerfully vivisected by a pig and a goose, and in almost every canvas the humans are joined by a chorus of anthropomorphic animals smoking, eating, and staring alongside them. It’s satire in a sense, though there is no curative, moralising aim, and no superiority either. Lewis knows full well that no one is really exempt from the temptations of junk, him and us included. It is the lack of exemption that really powers the most exciting canvases here: the viewer is drawn in because they are quite straightforwardly enjoyable. Aside from the humour, there is a kind of savage compositional exuberance – strongest in the swirling fight scene of Devil’s Juice (2018) – that, despite the ugliness, makes Lewis’s paintings a feast for the eyes. These are big canvases, painted fast and, on first glance, crudely, but with a singularly painterly approach to crudeness – long in the meditation, quick in the execution. Aside from the compositional nous on display, the influences that hover are people like Philip Guston, Max Beckmann, and George Grosz – artists plotting similar courses between realism and surrealism, refinement and roughness, abstraction and satire, seriousness and humour. Like theirs, Lewis’s work is strong stuff, and a lot of fun. ‘Dale Lewis: Fat, Sugar, Salt’ is at Edel Assanti, London, until 10 March.